The hospitality industry has been a fantastic supporter of what we are doing and the support just keeps on coming – please click here to see the article that was published today by the Publican’s Morning Advertiser. 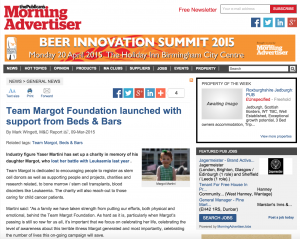 Team Margot continues to honour Margot’s legacy as a permanent Foundation. 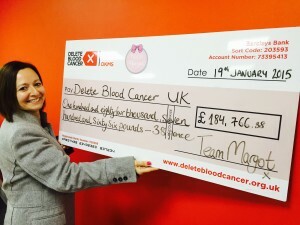 Team Margot Foundation is a newly registered charity. We campaign for more potential bone marrow / stem cell donors to join the register – especially people with a mixed genealogy. Margot’s mixed family background was the key obstacle to finding her a perfect match. 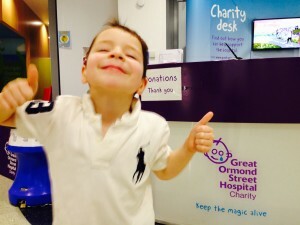 As a grant giving Foundation, we also support people and projects close to our hearts – more specifically charities and research related to bone marrow / stem cell transplants, such as blood disorders like leukaemia and those caring for child cancer patients. Currently, these include: Great Ormond Street Hospital Children’s Charity, Delete Blood Cancer UK, Anthony Nolan, Shooting Star Chase Children’s Hospice and Momentum. Everyone at Team Margot is a volunteer. Every penny raised for the Foundation will go to the wonderful people and causes we support. To donate money to Team Margot Foundation, please click on the above logo. Thank you.